If you are visiting Marrakech and looking for fine dining, Le Marocain should be at the top of your list situated in the middle of the park, the restaurant offers fine Morrocan cuisine in a chic yet informal setting at the centre of the prestigious La Mamounia Hotel. Upon approaching Le Marocain, your breath will be taken away by the beauty of the building. The lights and trees paving the way to the entrance set the scene perfectly as they lead you up to the large double glass doors. The beautiful pillars, the bright coloured walls, the grandeur and grace really do set you up for a great experience and delicious meal. 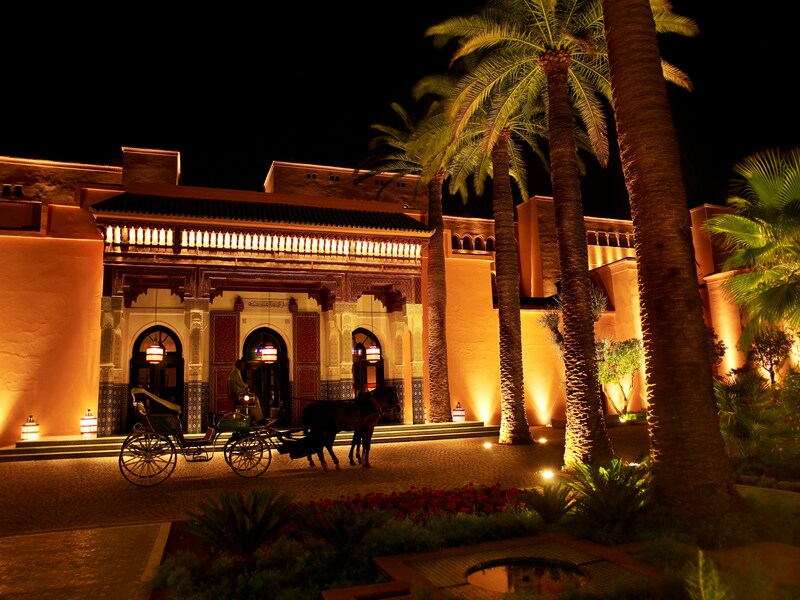 Not far from La Mamounia, you will be treated to the sounds of the city, alive and happening. As you approach La Mamounia, you enter a different world. Seemingly a million miles away from the snake charmers and street musicians, escaping the mopeds and constant horns, you will be blessed with an oasis of calm, far enough away from the activity to relax, yet near enough to feel exquisite. Originally, the building was opened in 1923 as a hotel, with the gardens being a gift from the Sultan Sidi Mohamed Ben Abdellah to his son Prince Moulay Mamoun. The hotel was graced by the presence of Churchill, who referred to the resort as 'the most beautiful place in the world.' The beauty and mystique are most definitely still there, with relaxation there for the taking amidst the utmost luxury. La Mamounia now boasts 135 rooms, 71 suites and three riads. Gloved doormen greeted us at the gates, leading us to the restaurant area, where we were able to enjoy the sweet sounds of a jazz trio playing along the way. There are four restaurants within La Mamounia, Le Marocain being the Moroccan cuisine. The restaurant offers two Moroccan menus, one traditional and another based on more modern Moroccan dishes. The other restaurants within the building include Le Francais, L'Italien and Le Pavillon de la Piscine. Le Francais and L'Italien are both Michelin starred restaurants. Choosing to combine traditional Moroccan dishes with some more modern tastes to get a feel for both sides of the menu, left me with some delicious overwhelming tastes. From delicious fresh salads to richer dishes, my taste buds were alive, excited and thrilled. The refreshing thinly sliced carrots in orange blossom were the perfect finale to refresh the palate before the main course. I am a lover of Morrocan food, so I was thrilled with the menu options and side dishes; it felt as though the menu was designed to me. I chose to indulge in the pigeon pastille and the mixed grill. Both dishes were cooked to perfection, with accompaniments of potato and red olives. I finished the dish feeling more than satisfied, with my previous hunger being a distant memory. Despite feeling full, I couldn't resist trying the tempting French pastries served with fresh mint tea for dessert. The dish worked wonders for my sweet tooth. They were deliciously memorable. However, despite being full and satisfied, I didn't feel my evening was quite complete. Thankfully for me, the drink options were also inviting, allowing me to be further seduced and entertained. Sipping my night cap, enjoying the jazz trio, I feel I could stay forever in the comfort and elegance of Le Marocain. I have a feeling my first will certainly not be the last.